While most brand marketers today are intensely focused on their social media efforts, many express frustration at the inability to quantify its value or incorporate it into their marketing mix. comScore Social Essentials is a breakthrough social measurement product that helps marketers do just that. The following white paper offers an in-depth analysis of how social media brand impressions reach Fans and Friends throughout Facebook, as opposed to just on brand Fan pages. 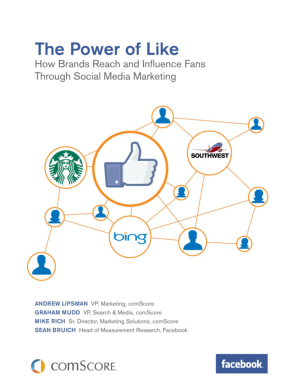 The study profiles three major brands - Starbucks, Southwest Airlines, and Microsoft Bing - to show the impact of these impressions on Fans and Friends and help illustrate how brands today need to be thinking about their social marketing initiatives.